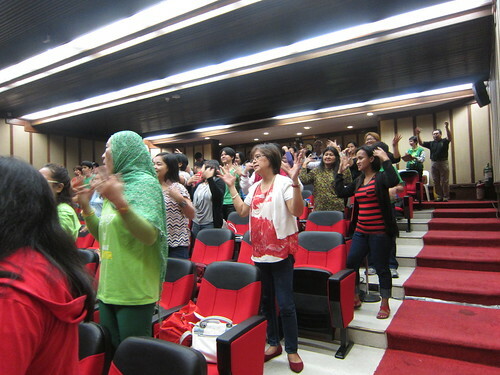 The Autism Society Philippines conducted a seminar, entitled “Music Therapy as an option for PWAs.” The seminar was held at Mini Theather Lopez Building Meralco Compound, Pasig City last October 25, 2014, attended by parents, professionals and advocates. The seminar was facilitated by Ms. Ma. Solinda Garcia-Bautista, one of the first batch of graduate students at the St. Paul University Manila College of Music and the Performing Arts, a Center of Excellence for Music pioneering Music Therapy programs in the Philippines. Music therapy is considered one of the expressive therapies, consisting of a process in which a music therapist uses music and all of its facets—physical, emotional, mental, social, aesthetic, and spiritual—to help clients improve their physical and mental health. Music therapists primarily help clients improve their cognitive functioning, motor skills, emotional development, social skills, and quality of life, by using music experiences such as free improvisation, singing, and listening to, discussing, and moving to music to achieve treatment goals. "Very good, very interactive and very ambitious. The seminar is excellent." "Covered both music and ASD. Could have given more sample studies." "The speaker is amazing. She is also able to show how to do music therapy in an easy way that even parents could do it with their children." "Informative all in all and a lot of things opened on me personally on the treatment of my child."